This past weekend's release of Brave is occasion enough for a recap of the year's kid-oriented movies—some fairly good, some bad. More on Brave and the rest, after the jump. First, the good, and despite some major flaws with its story, I do think Brave is good. That's because Pixar at least has the strong, resourceful princess Merida (voiced by Kelly Macdonald), as Brave's bedrock. In reality, Merida is not only Pixar's first princess; she is the natural progression—begun by the multicultural Tiana of The Princess and the Frog and followed by the thrill-seeking Rapunzel of Tangled—in a recent line of correctives to the formerly submissive Disney Princess. Merida has one foot in the fairy tale past, firmly planted there by her tradition-bound mother (Emma Thompson), and the other in the future: the valiant heroine refuses to conform to the plans laid out for her by society. If there are flaws to Pixar's adventure they stem from a small, insular quality that also afflicted Disney's last two Princess films. 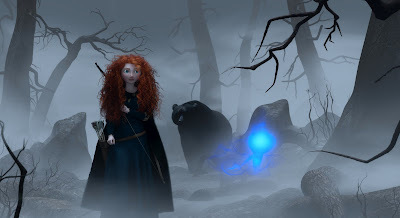 Brave's story just feels too small for its irrepressible heroine. It's a minor quibble about Brave, otherwise an oasis of originality in the wasteland of summer reboots and sequels. Now for the first of the bad. The Lorax is a crass attempt to capitalize on a beloved Dr. Seuss story to get butts in theater seats. It bears only the most rudimentary resemblance to Theodor Geisel's cautionary environmental tale. Instead, it opts to focus on the story's hollow, candy-colored surface details in order to lure children (and their parents) to hand over their money to Universal Pictures. Like the tale's greedy Once-ler, Universal is intent on dressing up The Lorax's lame script with Seuss-isms in order to pad their bottom line (going so far as to name one of its new characters Audrey after Geisel's wife). 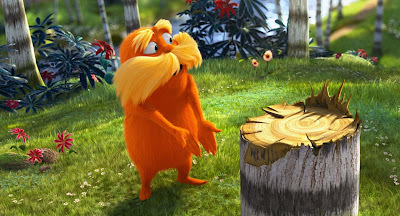 Unfunny, boring, and predictable, you won't be missing a thing by skipping The Lorax. 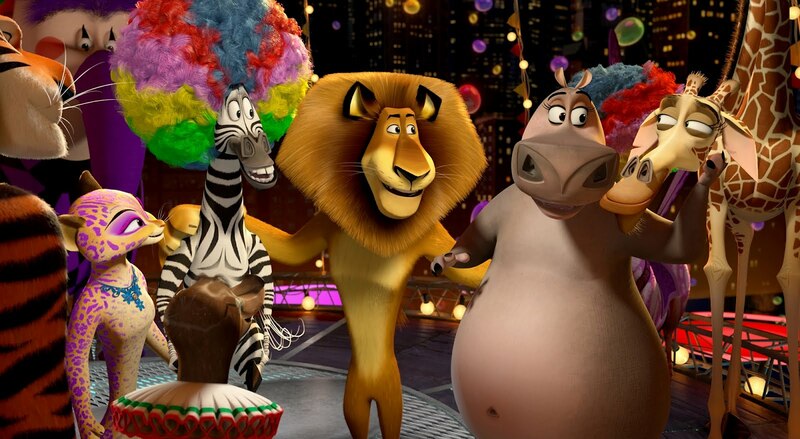 I was afraid Madagascar 3: Europe's Most Wanted, the newest entry in the Dreamworks franchise might be a naked grab for cash also. This after seeing the funniest bit in the trailer, Chris Rock's rendition of "Afro Circus," repeated ad nauseam. Happily, I admit I was wrong. This is my first brush with Madagascar, but after laughing as much as I did at this screening—even out loud a few times—I am certain I'll go back and watch the previous chapters I missed. Don't let the film's title or trailer fool you. Europe's Most Wanted, thankfully, doesn't spend much time in Monte Carlo (or even any kind of Europe we might recognize) with its annoying villainess, a female gendarme (voiced by Frances McDormand). That's because Madagascar's animal protagonists (Ben Stiller, Chris Rock, David Schwimmer, Jada Pinkett Smith) spend the majority of their time in a circus they purchased, trying to fit in with its troupe of animal performers (Jessica Chastain, Bryan Cranston, and Martin Short). Because of its kaleidoscopic art design and ample opportunities for humor, it is this portion of Europe's Most Wanted that will hold the most interest for fans of the series or even the uninitiated like myself. My initial instinct was to avoid Mirror Mirror altogether, since it looked like a lame attempt to ride the coattails of Enchanted-type fairy tale revisionism. But after discovering that Tarsem Singh directed it, I figured how bad could it be? I am a staunch defender of his first film, The Cell, a nightmarish science fiction film starring Jennifer Lopez and Vincent D'Onofrio. Singh's next film, The Fall, was a lush fairy tale that made my year end top 10 list in 2008. I regret not trusting my intuition. Despite its visually inventive prologue the flatly lit movie is rife with childish humor on the level of a Disney Channel sitcom. Told in the form of a shadow play, the prologue depicts how Snow White (Lily Collins) ends up at the mercy of her wicked stepmother (Julia Roberts). Mirror Mirror isn't even a proper showcase for its ostensible star, Roberts, the way this year's other iteration, the sensual Snow White and the Huntsman, is for Charlize Theron. I do have the movie to thank for bringing the coquettish Collins (daughter of singer Phil Collins) to my attention. All moon-eyes and eyebrows, she and the elaborate costumes by the late Eiko Ishioka (Dracula) are the only thing worth recommending about the film. 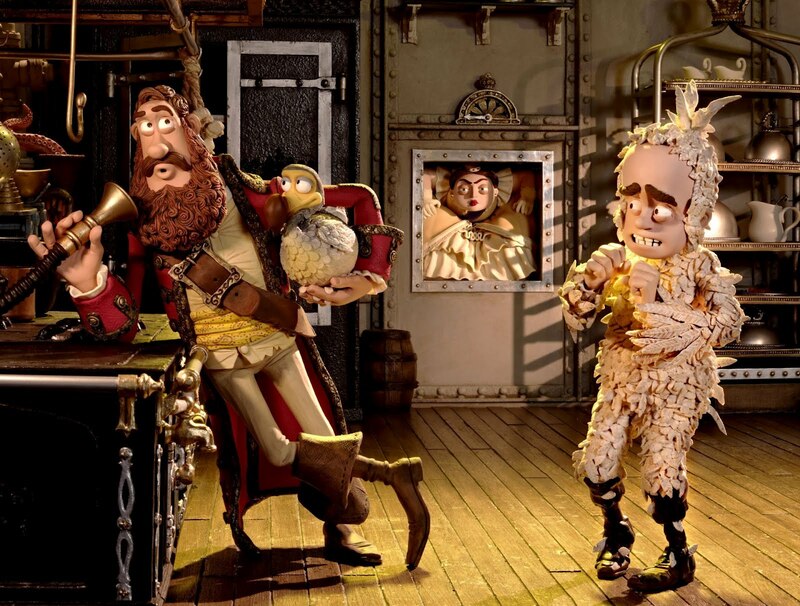 Loaded with dry wit, the latest from the British Aardman Animations outfit, The Pirates! Band of Misfits is a visually splendid lark. With its central conceit of a motley bunch of buccaneers kidnapping Charles Darwin (David Tennant) in order for their generically named Pirate Captain (Hugh Grant) to win the Pirate of the Year award, much of the humor will go over younger ones' heads. But this is a comedy where the excessive time spent on detail pays off. More laughs are found in tangential asides—such as an obviously female crew member disguised in drag known as Surprisingly Curvaceous Pirate—than in its central plotline. Not one of Aardman's best, but certainly there's enough here to entrance children and divert parents tagging along. Based on the novel The Borrowers, The Secret World of Arrietty strikes a curious tone for a children's animated film: sweetly elegiac. Its tiny, courageous heroine, Arrietty, forms a bond with Shawn, a sickly boy of what one would consider regular size. Among the most interesting qualities of the superb film is the starcrossed aspect of the relationship between Shawn and Arrietty. Her miniature family is frightened of the harm, inadvertent or not, that a normal-sized human might bring to them. And Shawn's caretaker is obsessed with exposing the tiny people she is only familiar with from childhood fairy tales. 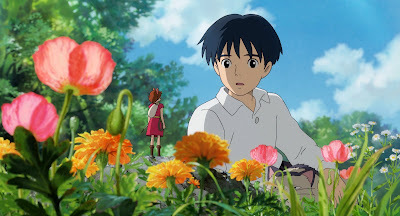 The isolation endured by Arrietty's family—the dreadful absence of others implying a slowly dying race—is keenly felt by the viewer, which is why this might best be seen by children ages 7 and up. Here's the thing about The Three Stooges. I didn't even like when anyone else replaced Curly. Why then would I wanna see 3 different guys? While to a certain extent, the Farrelly Brothers update doesn't really change my mind about the casting of the central roles, I can't really say the movie wasn't enjoyable either. Chris Diamantopoulos as Moe, Will Sasso as Curly, and especially Sean Hayes as the freakishly hair-styled Larry acquit themselves remarkably well. However, the Farrelly Brothers deserve a large part of the credit for styling the movie so that much of the humor is derived from the anachronistic Stooges' naive reactions to the contemporary world outside of the cloistered orphanage they were raised in. The nuns in charge of their home are played by a who's who of supporting players, from the gorgeous Kate Upton (pictured above) to singer Jennifer Hudson, with comedian Jane Lynch as the Mother Superior. Most hilarious (in a grating, love-it-or-leave-it performance) is Curb Your Enthusiasm's Larry David as Sister Mary-Mengele. In fact these are only a few of The Three Stooges' secret weapons, with Craig Bierko, Stephen Collins, Brian Doyle-Murray, and Sofia Vergara rounding out the supporting cast that serve as the movie's MVPs. If you have any doubts whether this movie is suitable for children, the Farrellys put that to rest with a surprisingly acute post-credit disclaimer that's quite funny in its own right.